Earlier this year, Dubspot Instructor and Director of International Programs Dan Freeman teamed up with AIMEC for a series of workshops on electronic music production using Ableton Live 9 and PUSH in five Brazilian Cities! 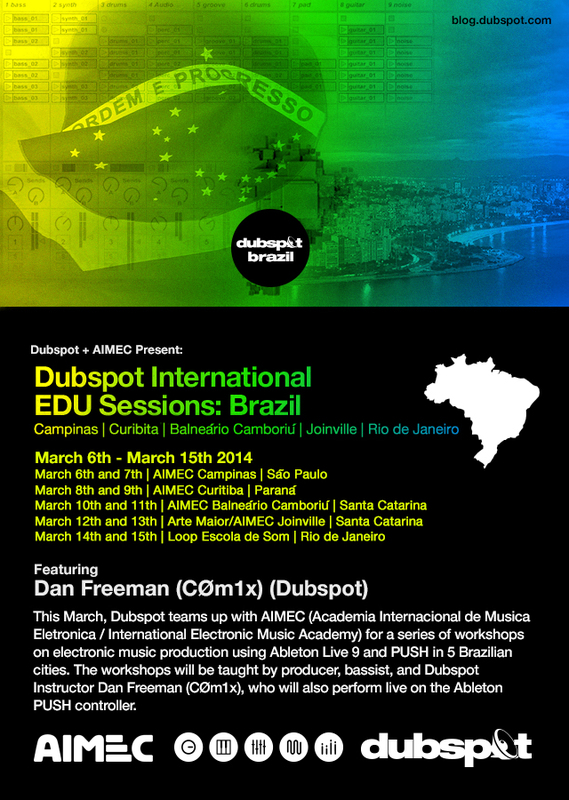 In March of this year, Dubspot Instructor and Director of International Programs, Dan Freeman (CØm1x), collaborated with AIMEC Brazil to launch the first Dubspot courses to take place outside of the United States. 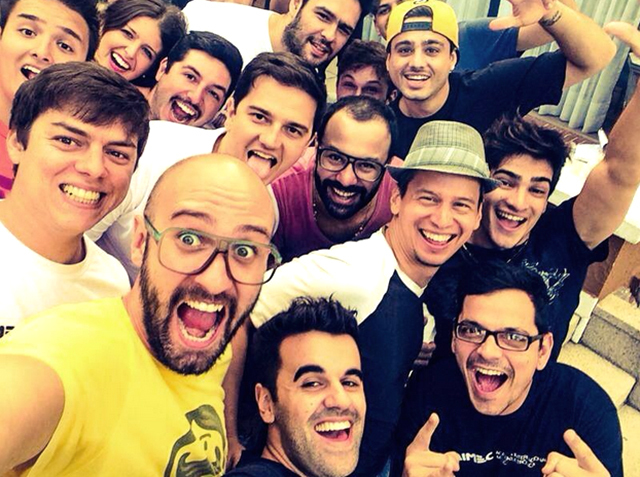 AIMEC Brazil is Brazil’s largest DJ and electronic music production school with locations in five cities. From March 6 to March 16th, Dan travelled to five Brazilian cities: Campinas, Curitiba, Balneario Camboriu, Joinville and Rio de Janeiro. 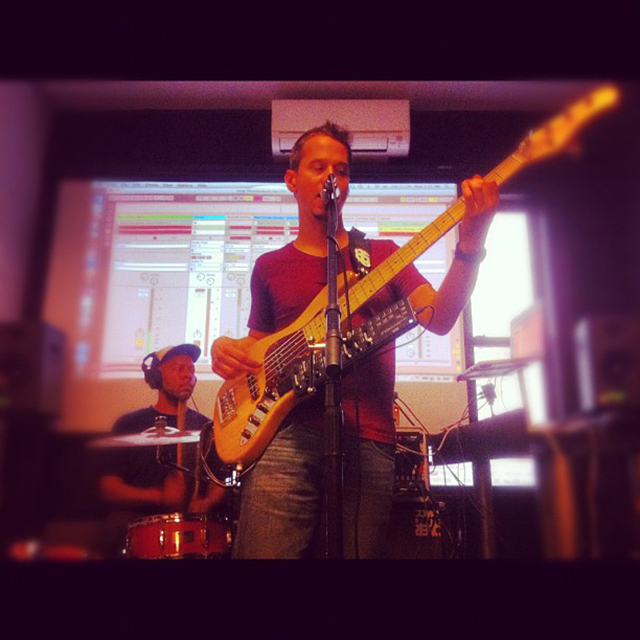 Dan taught intensive courses in basic beat building and production focusing on Ableton Live 9, PUSH and vocal recording. He also did a couple of solo live performances with the Ableton PUSH. Along the way, he was accompanied by DJ Rafael Araujo, one of AIMEC’s directors who oversaw the programs and helped translate the classes. Students received a joint Dubspot/AIMEC certificate for completing the six hour courses and were given some additional goodies including free Ableton Live 9 licenses courtesy of Ableton Brazil. We are happy to announce the winner of our free Ableton online course that each workshop student was eligible to win: Alison Aurelio Borba of Balneario Camboriu! We’re looking forward to launching more courses and workshops worldwide and we look forward to more collaborations with the AIMEC Brazil crew. Dan Freeman: That’s easy. Brazil has the largest population and economy in Latin America – and one the largest in the world. It also has a phenomenal musical culture. Just like in the US, the mix of African, European and indigenous peoples has created incredibly rich and varied styles both for music and dance. Now with the economic growth of the past decade in Brazil, the widespread availability of laptops and software, the club and DJ culture in Brazil and its indigenous musical traditions which already have worldwide appeal, Brazilian electronic musicians, bands, styles and DJs are already making a mark on the global digital music culture. As a new generation comes of age, one that has known laptops and the internet since infancy, Brazil’s influence as a global electronic music hub will only deepen. What sorts of audiences are these sessions aimed at? The sessions will be aimed at the same people that Dubspot seeks to reach here in the States: Producers, Artists, DJ’s and people who want to understand the flow and process of producing digital music. What will you be doing at the events? We’ll be spending two days going through how to build a track using Ableton Live 9, but focusing on fundamentals that are applicable to any DAW. This will include building beats, creating bass sounds and ideas for bass lines, textures and melodies, tracking vocals and basic mixing as well. Since I’m really into live performance and Brazil has such an incredible level of instrumental musicianship, we’ll also be spending time on techniques for live performance with laptops, from controllers to the PUSH, to integrating laptops with live vocals and instruments. I’ll also be doing a couple of live Acid House/Funk sets on the Ableton PUSH at a couple of venues with local DJs/electronic musicians. Why are you excited for this project? I love Brazil. I lived there for 6 months 15 years ago. My first major gig when I came to NYC right after college was playing bass in the pit orchestra of of the South American tour of the Broadway show ‘Grease’. We were in several Brazilian cities for a month at a time, playing pretty huge venues. I immersed myself in the music there, learned some Portuguese and spent a lot of time hanging with Brazilian musicians. After the tour ended, I took my earnings and went to live in Rio just so I could study Brazilian musical styles. Since then, I’ve always had a profound respect for Brazil’s musical culture and it’s really great to be going back to establish an artistic relationship between Dubspot and AIMEC. 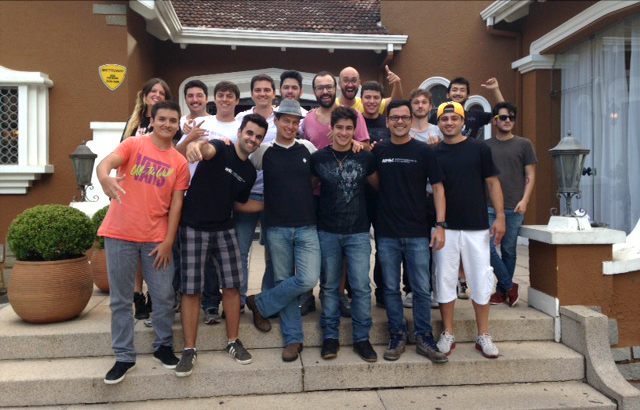 The AIMEC (Academia Internacional de Música Eletrônica / International Electronic Music Academy) was founded in Curitiba ­ Paraná ­ Brazil and has now opened subsidiaries in Campinas (São Paulo), Florianópolis, Joinville and Balneário Camboriú (Santa Catarina) and Porto Alegre (Rio Grande do Sul). Created in 2004, it is constantly innovating and promoting events like DJ Tournaments, lectures with renowned international musicians and workshops in clubs and festivals. The school also values every student’s artistic freedom and the networking that naturally stems from every group of students. AIMEC is considered the “Best DJ School” from Brazil, awarded by Rio Music Conference in the last two couple of years (2011 and 2012). On its team, it has the best instructors and professionals from the Brazil; people who have passion for what they do and have the love to share and spread the word and knowledge of electronic music. AIMEC has produced dozens of success stories. Many famous and successful DJs and music producers have been to AIMEC’s classrooms. And thousand of students in the past 10 years have taken AIMEC’s courses. « Ableton Live Tutorial w/ Thavius Beck: DJing and Performance Workshop @ Communikey 2014!